This is the first post in Trinidad’s three-part series on top drives. There is no question that top drives have changed the drilling industry. They have made rigs safer and more efficient. Plus, the technology allows us to reach drilling targets that were once considered unreachable. “The top drive drilling system is one of the most significant advancements in drilling technology,” said Brent Kryzanowski, General Manager, Canadian Operations and the Top Drive expert for Trinidad’s Canadian fleet. In this post, Kryzanowski explains how the game-changing innovation works. How do top drives work? A top drive is a device that has one or more motors and moves up and down a rig’s mast. Kryzanowski, who has worked with Trinidad for over 18 years, explained that a top drive connects to the top of the drill string (the length of pipe that goes down into a well and attaches to the drill bit at the bottom of the hole). A top drive provides torque and downward force as it rotates the bit through the formation below. 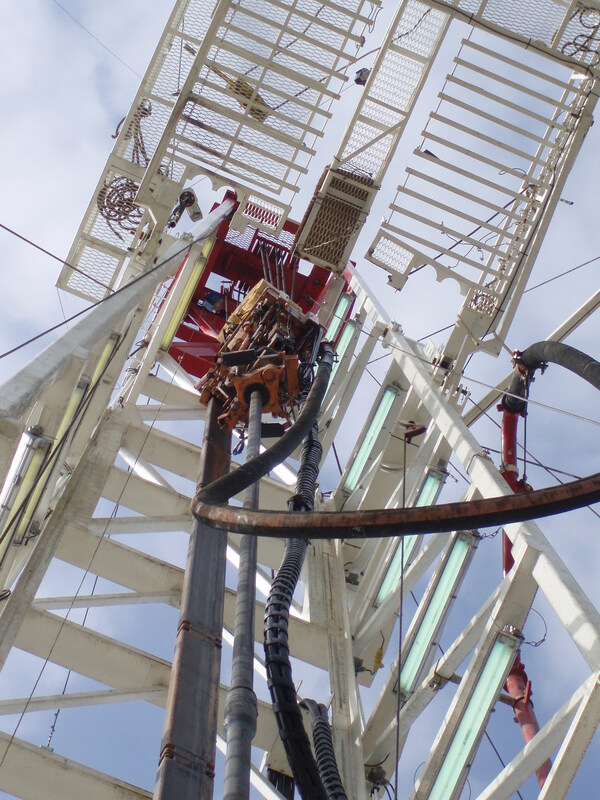 “The top drive has a watercourse for simultaneously supplying drilling fluid down the inside of the drill string, where it exits through the drill bit to cool and lubricate the bit, and carrying the cuttings (up) from the bottom of the well bore,” explained Kryzanowski. Kryzanowski compared a top drive to the drill press a person might have at home in their shop – only a top drive is a lot more powerful. Currently, Trinidad’s largest top drive is 1,150 horsepower. We’re going to discuss the benefits of top drives in detail in next week’s post, but here are some of the advantages top drives have over their less-powerful predecessor: the swivel and kelly bar. Increased efficiency: With a top drive, you can install multiple joints of drill pipe at one time, instead of just one. This greatly reduces the amount of time spent making connections when drilling a well. Reaching sophisticated targets: Top drives allow companies to drill high angle and horizontal wells because a top drive’s control system allows for more precise steering of the drill string. The use of a top drive also reduces the risk of stuck drill string when drilling horizontal wells. Safer rigs: Top drives eliminate the need for many of the potentially dangerous tasks that are performed on the rig floor where rig hands work. Top drive systems also increase safety because the top drive can be connected to the drill string immediately while tripping pipe, which allows crews to initiate well-control procedures faster, if needed. Take a look at this video from the American Association of Petroleum Geologists to get a better idea of how a top drive system works. Trinidad has one of the most technically-advanced fleets in the business. Right now, 41 of Trinidad’s 54 Canadian rigs have top drives. Plus, we’re always looking for ways to adopt new advancements that will help increase the performance and safety of our fleet. Want to learn more about the technology on Trinidad’s rigs? Check out these posts. Be sure to check our blog next week for the second installment of our top drive series.